When I first started vaping I fell hard for a liquid by Cape Fear. Their THALIAN liquid was just so damn good. I have not had it for quite a while and got to thinking I should make something similar to scratch that itch and I love this one just as much as theirs. I am not going to call this a clone or even a remix because I haven’t had theirs in so long that I don’t know how close it is if even at all. I just know I really enjoy that profile so here is my offering. TFA Dulce De LECHE....the flavor here is the result from reducing milk and sugar to a caramel consistency. The result is as you can imagine a sweet creamy yet unique caramel flavor. This in this recipe is what requires the steep. This one starts off strong but when it subsides the left over flavor is unlike any other. 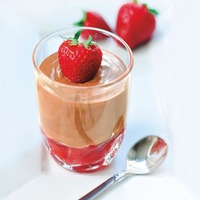 The strawberry combo in this recipe for me brings a freshish strawberry with a little syrup. Super sweet is as always optional. It’s just the way I prefer this recipe. This recipe is the property of VapinTrucker and released under the CC Attribution-NonCommercial-NoDerivatives 4.0 license. You may not copy, derive or commercialize this recipe without following the terms of this license or the explicit permission of the creator.